With Frank you will find everything you need to keep your bike in top condition. 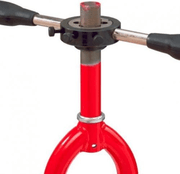 Sets to repair your bicycle tires, cleaning products and degreasers for a shiny frame, work stands to work on your bike at height and all the tools you could possibly need. The maintenance of your bicycle is of great importance, especially in the wet climate in the Netherlands and Belgium. At Frank you will find more maintenance articles than you thought possible. Maintenance requires of course tire repair and cleaning and lubricating your bike. Do you have a flat tire? No problem, at Frank, all types and brands of tire repair kits are available: from solution to tire levers, from spoke keys to fork extensions. You've probably heard of the brands Topeak, Cyclon, Icetoolz, Marwi, Tacx, Cordo and Park Tool. All these brands have put all kinds of maintenance items on the market especially for the bicycle. In our range: brushes, degreasers, assembly paste, various lubricants and paints. Your bike saddle will be smooth again with saddle grease. Your bike looks clean and fresh again thanks to the degreasers and is also provided with a protective layer. You are also at the right address for accessories for the various cleaning products. Maintaining your bicycle well is of great importance. The better you maintain the bike, the longer the bike will last. This requires good bicycle tools. Is it time to lubricate your chain, no worries, Frank has everything to keep the bicycle chain running smoothly and smoothly. However, we also stock all types and brands of bicycle tools for maintenance of your parts group. For the cassette and chain we have, among other things, pointers, cassette holders, chain punches in all shapes and sizes. Crank tractors, crank straighteners, wire tubes and cuppers are available for the crankset. And is it not convenient to place the bike on a working standard? It is of course superfluous to mention that we also have these in the assortment.